Showing results for tags 'suburban'. Hello first post. I have a 2015 suburban with horrible FM reception. I have replaced the Radio, HMI and antenna booster. no change. I'm hoping to find out if anyone has had this problem and was able to repair. My next attempt will be to use an aftermarket FM window antenna to replace the OEM in glass antenna. Could there be another module causing maybe the control bezel? Best colour for Suburban & Yukon??? Hi there, new to the forum here and was hoping to gain some wisom from you folks. I'm in a dilemma and am having a difficult time choosing between the Silverado or the Suburban. I'm currently a paramedic in the great white north and like to go fishing, hunting, mountain biking, etc. The space in both is more than enough for me but I'm wondering which is the better vehicle? Most of the gear I'll be carrying will need to be dry so If I do get a pickup I'll have to add a shell to the back. So the question is: do I buy a suburban or a silverado with a decked out bed (what functionality do I lose going either way)? I'll be daily driving this car/truck so it will need to be a great all rounder (city driving, long road trips, light offroad, driving empty, etc). Do I lose any ground clearance/off road capability if I get the suburban, and do I lose any creature comforts if I get the silverado? Specifically looking at the LT or the Suburban and the LTZ for the Silverado. Bonus question: Do you think its worth upgrading to the GMC lineup? (ex: Yukon XL vs Sierra) They seem pretty similar give or take a few cosmetic things. Would love some insight into this issue. Thanks in advance! Hey all, well I had actually intended to buy a 2017 Suburban, but ended up buying a new house last year. So after a year delay, I finally have a 2018 that I picked up the first week of November, and boy was it tough to find! Wanted a closeout 2018 Suburban Premier 4x4 with just the 3.42 gears and Adaptive Cruise, and NOT a black interior or exterior. Little did I know that the vast majority of Suburbans in my area would have black interiors the standard 3.08 gearing, and other useless junk that I didn’t want like power running boards, sunroof and DVD stuff, etc., with MSRPs up at $78-80k!!! I finally found TWO identical Burbs in Pepperdust with Cocoa/Dune interiors with just adaptive cruise and 3.42 gears. One had the standard 20” wheels and the other the chrome “SEY” 22” wheels. The one with the 20’s had just been sold, so knowing the potential ride quality and vibration issues with the 22’s, just said to heck with it and went for it and got a great deal, and plus I really loved these particular 22’s. Love it so far. Powertrain: Power is just right with the 5.3L and 3.42 gearing. I don’t find it lacking at all, and it has plenty of giddy up when you really need to get moving. Yeah, the 6-speed gearing is spaced a bit wide. It would be about perfect with at least the 8-speed, but it works just fine. I had a couple of rental Suburbans over the past 2 years, all LT’s with base 3.08 gearing and just found them to be lethargic and you really had to prod them and get kickdowns to get moving. The 3.42’s are just right, and wasn’t going to buy a truck without them. Ride, Handling, & Noise/Vibration: This was really important because of numerous family members that get motion sick. You might think it odd to be going with the Magnetic Ride and 22” wheels, but actually, the Premium Ride suspension with 18” wheels was sooo floaty and had so much body roll and motion that even I got a little motion sick test driving one! My family members would have puked. Lol. So MR was a must for us. Love how there’s virtually no body roll with the MR suspension and how solid it feels. Optimal would have been the MR with 20’s which was perfectly smooth and vibration free, but almost every single Burb Premier in my area has 22” wheel upgrades, so finding one with 20’s and only the specific options I wanted AND with something other than the black interior was asking a bit much. No, the ride is not glass smooth. You feel bumps in the road, but we’re used to firm but compliant European/BMW suspensions, so feeling bumps in the road is okay. The 285/45R22’s are “sporty” but not exactly low profile, so while you do feel bumps, the adaptive damping of the MR suspension keeps things pretty compliant and comfortable, along with the much longer wheelbase than what we’re used to. Yes, it has some of the vibration and body resonance issues, but for the most part it’s minor and well damped and not resonant. It’s only a constant and annoying right at 66 mph, so I just avoid going 66. I think we’ll just ride out the Bridgestones or at least get some mileage out of them, but for sure will eventually replace with the Michelins. I don’t think we’ll need to go down to the 20’s. It’s weird that I find the ride perfectly acceptable, but that the aural sensation of the body resonance/vibration is what I find “harsh” at times. The ride itself is surprisingly decent for 22” wheels, so really just the noise issues from the tires causing vibration to the body. Strange beast, but okay with it for now. Overall Drive: I love how this thing drives. I’m not sure what the secret sauce is yet, but every review I’ve read that said the Suburban drives like a much smaller vehicle than it really is is true. I think it’s one part tight steering with a really nice feel and weight and (shock) even a bit of feedback despite being electric, another part the Magnetic Ride suspension and keeping body roll and motions under control, and who knows what else. The tight turning circle for such a massive vehicle is truly impressive. You’d think it’d take a mile to turn this barge around, but no, it’s surprisingly maneuverable in tight parking lots. It definitely gobbles down the miles like crazy on the highway too. It tracks straight ahead with very little correction needed, and I love the HUD and adaptive cruise. Near following distance works great on multi-lane highways, and then far works great for two lane country roads. Takes so much of the fatigue out of long distance driving. Interior: Went with Cocoa/Dune and 2nd row Captain’s Chairs. I think the materials are nice enough, and while there’s definitely some cheap bits, it’s below the waistline and not stuff you’d typically be looking at and having your hands on. The 2nd row seats have plenty of space. I can “sit behind myself” just fine at 6’3”, although the outboard 3rd row seats definitely aren’t for anybody over 6 feet tall. 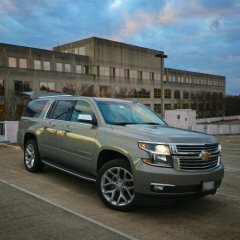 A selling point of the Suburban to me was the fact that you can actually sit 3 adults across the back row. I also looked at the Traverse, but that center 3rd row seat is really only a half seat, and while we might have been able to get away with it now, a few years from now it’d have been an issue. The overall floorpan of the Suburban was perfect for us, with just the right balance of passenger space while still leaving enough cargo room. Infotainment and Tech stuff: We traded my wife’s 2012 BMW X5 for this, and she swapped cars with me and is driving my 2011 BMW 335i convertible now. I’d been driving that since new (yes you can fit car seats in it no problem! Lol!) but it didn’t even have iDrive in it, so any tech stuff in a car is a big leap for me. I’ve never been able to figure out Fords, but GM’s setup works just fine for me, icons are large, the touchscreen works well, and menus are reasonably simple. Navigation worked as well as Waze over our Thanksgiving road trip, and holy crap, Sirius XM just take my money now!! I thought I had this in my 335i custom order, but apparently missed a tiny little option box and didn't get it on that one, and am not even sure on our traded X5?? Lol Exterior: Pepperdust Metallic wasn’t my first choice of color, but I needed to have the Adaptive Cruise, 3.42 gearing, something other than a black interior, and no other junk I didn’t want before having my first choice of color, and NOT a black exterior either, so no I didn’t get my first color choice, but I think it looks nice when the sun is out. My wife and I are both more partial to some of the blues which look really nice, but we both preferred to get a better deal and the exact options we wanted too, so didn’t do a custom order or anything. I almost bought a Blue Velvet with Mahogany interior, but it had the 3.08 gears, power running boards, and no adaptive cruise. It was an insane deal, but the dealer jacked the price up by $3k as soon as I asked about it and then wouldn’t budge, so I walked. Glad I did. I like what I got much better. I think the Pepperdust will grow on me, and it has decent road contrast too, so I’m happy with it. Overall very pleased with the purchase and the initial quality. Here’s what it was up against. I need to be able to transport 5-7 passengers AND a small 20 lb dog anywhere we might need to go, including international trips to the airport or road trips with all of our luggage. CROSS SHOP LIST BMW X7 and Mercedes GLS: The issue with these and pretty much any large crossover SUV is that they might seat up to 7 or 8 pretty comfortably, but have basically no cargo space with the 3rd row seats deployed. They’re not much bigger than a Tahoe, and I’m not going to spend $70-80k on one of these just for it to not be big enough, and have to use all sorts of external carriers and junk. Nah. My wife really wanted an X7 and we waited to see the official specs and photos, but sorry, 11 cubic feet of cargo space with the 3rd row deployed isn’t gonna cut it! LOL Minivans: I'm sorry, what? No can do. Negative ghost rider, the pattern is full. My wife and I haven’t been through all that we’ve been through and all of the crap we’ve had to deal with just to end up driving a (bleeping) minivan. She refused to drive one and I refuse to drive one, so that’s that. I did actually rent a Kia Sedona (or Entourage) on a trip once two years ago, and really liked it! It drove and handled nice, loved the power sliding doors, and had a ton of space. I was like, wow, this is so cool, too bad we'll never have one of these! That said, the Pacifica looks really nice, and maybe the Odyssey, but I’d rather slit my wrists. Lol. I could do a Pacifica I think, but only if I did a two for one and got a Challenger R/T at the same time. Ford Expedition Max: It was pretty much down to a Burb or the new Expedition Max. I actually rented a “Chevy Suburban or equivalent” from Enterprise a few months ago when my folks were in town and we needed a bigger vehicle for the weekend, but turned out to be a brand new Expedition Max. The deal breaker with the Expedition Max was totally insufficient cargo space behind the 3rd row. Ford claims only 3 cubic feet less than the Suburban, but that’s total BS. The Burb has MUCH more space, and I even broke out all of our luggage to prove it! The Expedition is proportioned to have a bit more passenger space, and the 2nd row seats do slide fore and aft a bit, but we didn’t find the Suburban passenger space to be lacking at all, and it had much better cargo space, so done deal. Believe me I’m a fan of modern direct injected turbocharged 6-cylinder engines - the straight-6 in my BMW 335i is glorious and the turbodiesel straight-6 in our X5 was brilliant, but Ford’s 3.5L V6 EcoBoost engine didn't win me over at all. It sounded and felt rough, and about as inspiring as a blender. Yeah, the power and torque were there, but the 10-speed was mostly skip shifting and wasn’t going to be all that different than a 6 or 8-speed transmission for the most part. A couple times I felt it clicking through gears sequentially like riding a bicycle, which just felt odd and excessive. Does it really matter if the RPMs are 100 higher or lower? I hope GM’s 10-speed calibration of this transmission is better, but I just didn’t like the Ford. In comparison, GM's good old-fashioned naturally aspirated 5.3L V8 sounds and feels glorious, still has plenty of power, gets perfectly decent fuel mileage for me, and the 6-speed works perfectly fine with the 3.42 gearing. The Ford also didn’t have their adaptive suspension, which probably explained why the body roll on it was crazy. It felt like it was going to tip over, which is how I knew we definitely needed the MR suspension. I didn't hold that against it, but overall nobody was won over by the Expedition Max, and the lack of cargo space behind the 3rd row was a joke. Only 3 cubic feet less than the Suburban my ***. I don’t know why Dodge has never made one of these, but I did look at the Dodge Durango. It’s too narrow, and really only 2+2+2 seating, and just wasn’t going to work. It's really a Jeep Grand Cherokee XL, which is fine, but we didn't need a little more space than our X5, we needed A LOT more, and this was just going to come up short. I did also take a serious look at the Chevy Traverse and had actually set on buying it for awhile. It’s a good $20k cheaper than a Suburban comparably equipped, has a workable 3rd row AND decent cargo space. I almost could have gotten away with it, but I knew I’d end up needing an external cargo box in some situations, and then the realization squeezing my 6’3” carcass back there back to back with a Suburban was that that center 3rd row seat is really only a half seat, so I said forget it. I made that mistake before with another vehicle. The color choices were godawful and nonsensical on the Traverse too. I only liked the Black Currant (dark red) color, available only on the Premier trim, but you can only get it with a black interior or this nasty and disgusting grey/tan abomination. You can get a nice Mahogany interior going all the way up to the High Country trim, but then you lose the nice exterior colors?? I could have rocked a Traverse, but the nonsensical exterior and interior color choices turned me off as much as the other things. Denali XL: Just didn't seem worth the bit of extra money to me. Not going to be towing anything regularly, still have the BMW 335i if I want to go faster, and I'd feel wrong putting regular grade fuel in the 6.2L. I know you can do it (it says so in the book), but that engine with 11.5:1 CR really wants premium. The 5.3 is more regular grade fuel friendly, and that's all this vehicle is going to get. So a Suburban it was! Glad we waited, found exactly what we wanted (minus exterior color not being first choice), checked out ALL of the competition and other options including the BMW X7 which still isn’t even available and is just in pre-order stage right now. Due diligence done, found our Burb and got a great deal, and no regrets. My wife wasn’t exactly happy leaving her “baby” X5 at the dealership and driving away in a Suburban rather than an X7, but that vehicle just wasn’t going to work for us, and $80-90k wasn’t in our budget either. She loved the deal we got on the Burb, and how angry I made all of the sales managers and finance guys. Lol! It’s really grown on her after our 500 mile Thanksgiving road trip. She loves all the space, it really does ride and handle nice for such a large vehicle (she hasn’t driven it yet), there’s the feeling of safety and security in such a behemoth too, and the fuel efficiency is surprisingly good for its size, while still having really nice passing power. Best of all our kids didn’t fight even once, everybody had more than enough room including the dog, and nobody got motion sick. We love this thing. Glad we finally have our “Canyonero”. LOL! Hope you all enjoyed my little 2 year long on again off again but finally got it done automotive buying adventure! My 2002 Avalanche suffered from terminal body rust, mostly from the edges of the painted metal wheel wells being damaged by road debris. My 2011 Avalanche has plastic OEM fender flares that protect the bottom metal edge of the metal fender from stones and debris thrown by the tire. Plastic takes the abuse, rather than painted sheet metal. It is starting to rust in other places, but not the wheel wells. I’m thinking of a 2019 Suburban RST, but they seem to have no protection for the wheel wells - just paint over the steel of the wheel well. 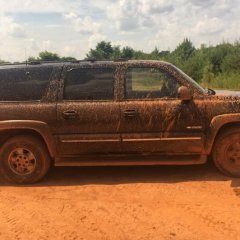 Has anyone done a mod to add the plastic late model Avalanche style fender flares to a Suburban? I don’t want radical wheel flares that appear to be attached with stove bolts... Just something to protect the edge of the fender well from stones thrown by the tires. Any suggestions or experience with this? Hey everyone, After repeated temptation, I've bit the bullet and bought a GM truck as a project car! Specifically, it's a 94 Suburban C1500 Silverado - it's my first car of this kind and I'm really enjoying it so far. It needs some work, but that's the point, right? Right away, there are 3 items on my hit-list: Front wheel bearings Power Steering Idler arm Power Steering Pitman arm Would the bearings be well served if I took them apart, repacked with grease, and reinstalled - or should I buy new ones? Also, how challenging is replacing the Idler/Pitman arm without power tools or a lift? I'm wondering how difficult it would be with a ratchet, breaker bar, and jack stands (I can rent the Pitman puller). Cracks in front wheel wells - please identify these parts? My Chevy Suburban 2001 has survived over 265K miles. We are keeping it for at least another 4 years if not longer. Recently replaced transmission (by AAA certified repair shop) in April, then alternator (by dealer service dept) in May. Nothing else significant for a few years. This week discovered these cracks in upper wheel well area, they have grown rapidly, and now showing red coloring. Can someone identify the system and parts please? Passenger side photo shows the top of the tire as reference, and includes a part number. Going to Chevy service tomorrow, wanted to have a clue first. 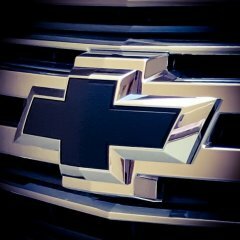 Zane Merva Executive Editor, GM-Trucks.com 8/14/18 Chevrolet is slamming the robust 6.2L and 10-speed transmission combination into another Tahoe and Suburban trim. Now, in addition to the RST trim, full-size Chevy SUV buyers can opt for the "Premier Plus" special edition of either model. The Premier Plus Tahoe and Suburban have a unique Black and Mahogany Interior, 22 inch polished wheels, magnetic ride control, a heads up display, 8-inch digital gauge cluster, and power chrome steps. Oh... and with 420-horsepower. These special editions should be temping for anyone looking at grabbing up the current generation Suburban and Tahoe. Unfortunately, these features won't come cheap. The 2019 Chevy Tahoe Premier Plus will start at $74,100 while the Suburban starts at $76,900. Both require a $1,250 destination fee. 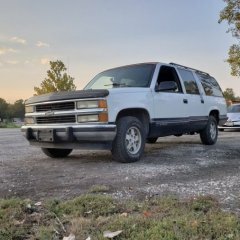 I have a 2000 Chevy Suburban LT. This is under the steering wheel on the right side by the footwell. I was told it could have been used for a phone?